Pete Drummond (Robert Harris), a make-up artist for American International Pictures (the real life studio that produced the film), is fired after twenty-five years of employment. This does no sit well with him, so he mixes a mind controlling drug into his make-up and lures two young actors into becoming the instrument of his revenge. He makes Tony Mantell (Gary Conway) into Teenage Frankenstein and Larry Drake (Gary Clarke) into the Teenage Werewolf, and then sends them off to murder the studio executives who wronged him. It’s interesting to find a film so metatextual coming out of b-cinema in the 50’s. 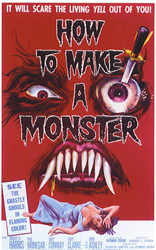 This film acknowledges a lot of AIP’s earlier films (‘The She-Creature’ (1956), ‘I Was a Teenage Werewolf’ (1957), and ‘I Was a Teenage Frankenstein’ (1957) among others). It gleefully paints AIP and its executives in a less than flattering light and takes great joy in having monstrous teens destroy them. Robert Harris is very enjoyable as the increasingly unhinged Pete Drummond. I thought the teens were a bit dull, but since they spend the majority of the movie as hypnotized murderers in monster costumes, it’s not really an issue. Interestingly, the movie switches from black & white to color for the fiery finale.